Many readers will remember the former Norwich City Justin Fashanu, who was one of English football's biggest prospects at the beginning of the 1980s after bursting in to the Canaries' first-team in 1979. However, as the decade progressed, his star waned and he had a rather difficult time of it, which saw him playing for clubs in England, the United States and Canada. He came out as gay in 1990, the first English professional footballer to do so, and was thereafter vilified by many inside and outside football because of his sexuality. Controversy followed Fashanu wherever he went, and after spending most of the 1990s playing in England, Scotland, Sweden, Canada and the United States, he finished his playing career rather quietly, hanging up his boots after a spell with New Zealand side Miramar Rangers. He committed suicide in May 1998, aged 37. It was a sad end to a turbulent life, during which he was remorselessly stalked by the spectre of homophobia, both on and off the pitch, which surely took its toll on him and was perhaps the biggest reason why he never quite fulfilled his potential. Ten years after Justin Fashanu's death, The Justin Campaign was founded his memory, and was conceived in order to raise awareness of homophobia in football at all levels, to help increase LGBT participation in sport and assist in challenging the negative stereotypes surrounding LGBT people. The organisation was behind the first Football v Homophobia Day, which was held on 19 February 2010 and saw various events being held across the UK and further afield, the most important of which were an exhibition in Norwich's Millenium Library on Justin Fashanu's life and career and a football tournament at Carrow Road, home of Norwich City. Since then, the campaign has become an annual event, and has mushroomed to cover the entire month of February, which coincides with LGBT History Month. The Justin Campaign no longer organises the Football v Homophobia campaign - this has become the responsibility of Pride Sports, an organisation which came into existence in 2006 with a view to tackling homophobia and increasing LGBT activity in sport. Keph Senett, the Football v Homophobia liaison officer for the Americas who is based in Canada and describes his own role for FvH as engaging "with clubs and organisations in this part of the world, usually in terms of getting their participation during this month of action", was asked how the campaign originally came about; had a particular incident taken place which sparked off the FvH campaign, or was it an idea which had been gelling together for some time before the campaign was originally launched back in 2010? "Definitely the latter. A core group from The Justin Campaign had been talking about ways to tackle homophobia in the game and eventually they put together a campaign organized around the legacy of Justin Fashanu." Pride Sports took over the running of the campaign in 2014. The Justin Campaign is no longer involved with Football v Homophobia, Senett said, "only in spirit. In the end, the Justin Campaign did not have the capacity to deliver the campaign." Senett was asked whether there has been much support coming from within football circles for FvH since its inception, and whether football supporters - both LGBT and heterosexual - have taken to the initiative. "I suppose it depends on what you mean by support. We have seen huge engagement from grassroots football and fans, and have made some great strides in promoting inclusive programming. Fans engagement, in particular, has grown exponentially. As well, we've had a great many clubs participate each year, wearing FvH shirts and holding special events. As for heterosexual football followers...I'm not really sure how you would determine this. Many of individuals and groups who involve themselves with our campaign operate from an inclusion perspective, meaning, presumably, that many are heterosexual. If what you mean is support in the terraces, I think we have definitely seen progress there as well." Football v Homophobia has been involved in a number of small-scale initiatives across Europe, including football and futsal tournaments in Bosnia-Herzegovina, Romania, France, Russia, to name but four countries. It is also involved with (social) media campaigns to help spread the anti-homophobia message in countries such as France, Serbia and Macedonia. Plays and exhibitions broaching the subject of LGBT rights are being held in Slovenia and Austria, and Austria is also hosting a campaign by Fußballfans gegen Homophobie Österreich aimed at giving advice to fans on how to challenge homophobia and where to go to seek support in doing so. Senett was asked how the campaign was funded and whether FvH had approached any foreign clubs - or any of the bigger European club - to help spread the message that homophobia is unacceptable; he provided a brief response. "FvH is run by a small group of volunteers and associates. Our international work is funded by FARE. We do not receive any government funding. We work with FARE internationally and have not approached any of the European clubs directly." He affirmed that FvH has seen tangible signs of success since it was first launched back in 2010: "We've seen an increase in reporting of homophobic incidents recorded by Kick It Out, and there is more awareness by football authorities of the need to tackle LGBT discrimination (for example, last year at their diversity conference, UEFA made explicit reference to homophobia)." This is encouraging, but obviously more needs to be done throughout the game. No Northern Irish or Scottish clubs appear to be involved with Football v Homophobia this year. Happily, clubs at all levels of the game in England and Wales have stepped up to the plate this year to show their support. A number of clubs have been - and will be - holding designated days this month (or early in March) in an attempt to inform fans. Some, ranging from Man City, Spurs to Welsh Women's Premier League club Aberystwyth Town Ladies wore Football v Homophobia T-shirts during their warm-ups. Man City also advertised the FvH campaign during their match with Spurs. QPR invited London Titans, a team composed of gay players, on to their Loftus Road pitch before the local derby against Fulham. Clapton FC's Clapton Ultras unfurled a giant Rainbow banner before their match with Hullbridge Sports, and let off flares in the rainbow colours at the end of the match. 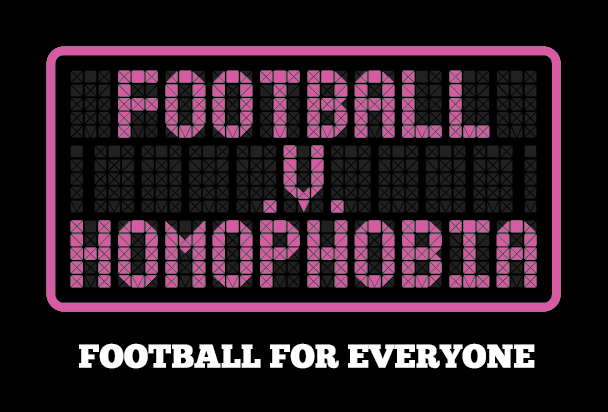 Both teams wore anti-homophobia T-shirts before kick-off in a show of support for the FvH campaign. 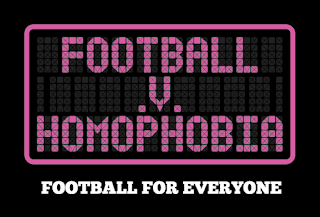 The following clubs are showing their support for the Football v Homophobia campaign: Aberystwyth Town Ladies, Airbus UK Broughton, Alfreton Town, Aston Villa, Barry Town, Bexley Invicta, Birmingham Blaze, Birmingham City, Blackburn Rovers, Bolton Wanderers, Brighton BLAGGS, Brighton & Hove Albion, Cardiff City, Cardiff Dragons, Castlecroft Rangers, Chelsea, Clapton FC (via Clapton Ultras), Colchester United, Crystal Palace, Team Derby, Dulwich Hamlet, Exeter City, Fleetwood Town, Fulham, Gillingham, Gresley, Hafod Ladies, Huddersfield Town, Hullbridge Sports, Knaphill AFC, London Titans, Manchester City, Manchester United, Merthyr Town, Newcastle Town, Newcastle United, Newport County, Norwich City, Nottingham Lions, Portsmouth, Queens Park Rangers, Sheffield United, Spurs, Sunderland, Sutton United, Walsall, Waltham Forest, Whitehawk, Wigan Athletic, Woking, Wrexham and Yorkshire St. Pauli. A number of county FAs (and Fans for Diversity, supported by the Kick It Out campaign and The Football Supporters' Federation) are also supporting the FvH initiative: the Derbyshire County FA, the Dorset County FA, the Hertfordshire FA, the Surrey County FA and the Sussex County FA. Many clubs and supporters' groups are supporting it on an unofficial level. Racism is being tackled in football, sexism and the lack of disability rights less so, but homophobia in all its forms is still a taboo subject, both on and off the pitch. It is a subject which needs to be broached, but football - which is probably the most homophobic of all sports played, watched, read about and supported across the world - and the media still have a tendency to pay lip-service to eradicating it. Campaigns such as Football v Homophobia, although you would think they should not be needed in this day and age, play an essential and welcome part in reminding us all that we are all people, regardless of race, religion, disability, gender and gender preference, and that discrimination of any kind has no place in any society that regards itself as modern. AUTHOR'S NOTE: Many thanks to Keph Senett from Football v Homophobia for taking the time to respond to the questions posed to him, and to his colleagues at FvH for their help. Other information was taken from various club websites and Facebook pages, and also from the Justin Campaign Pride Sports, FARE, CAFE and Football v Homophobia websites. Any errors and/or omissions will gladly be rectified upon receipt of notification. A follow-up article will hopefully follow in the coming weeks.